Economic development opportunities are opening up for Warren, Butler, Ohio, and Daviess counties along the new Interstate 165, formerly known as the William H. Natcher Parkway. Governow Matt Bevin joined local elected leaders and business representatives in Bowling Green on Tuesday to celebrate the designation. The project, announced in 2016, will upgrade the 70-mile corridor between Bowling Green and Owensboro to an interstate spur. The Kentucky Transportation Cabinet and Federal Highway Administration agreed last fall to officially designate the Natcher Parkway as I-165. Governor Bevin said new signage that's currently being installed sends the message that Kentucky is open for business. 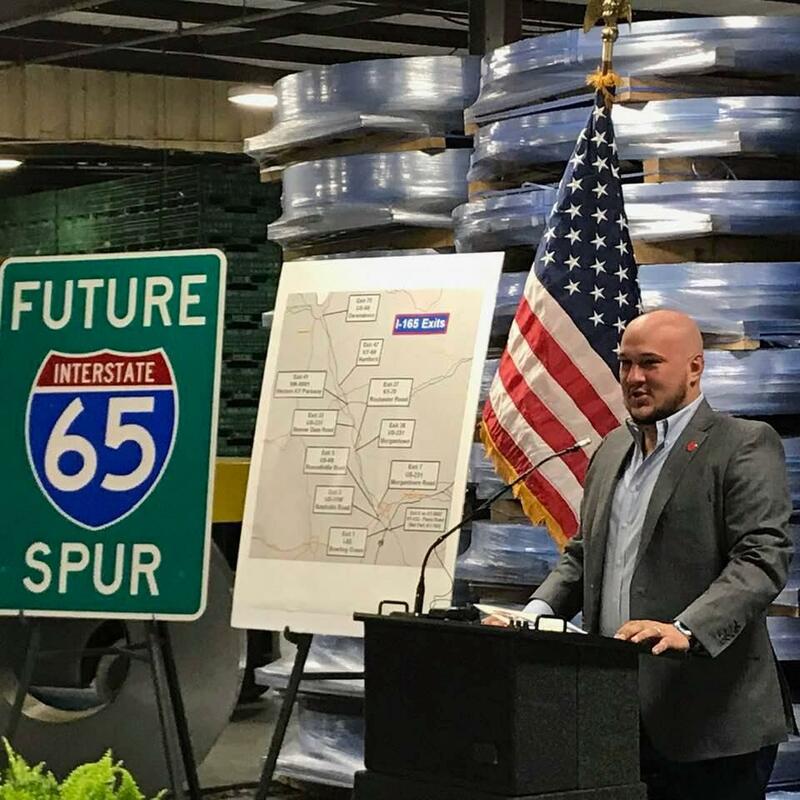 Fuji Avdic, president of Stryker Logistics, speaks at an event marking the designation of Interstate 165, formerly called the William H. Natcher Parkway. Bevin spoke at Stryker Logistics, a warehouse and distribution center in Bowling Green just off 1-165 that expects to benefit from the interstate. Safety upgrades are also a major part of the project to bring the parkway up to interstate standards. Three toll booth interchanges dating back to when the parkway was a toll road will be reconstructed in addition to improvements to exit and entrance ramps, and raising overpass bridges to increase clearance. The project will maintain the legacy of the former parkway bearing the name of Congressman William H. Natcher. Portions of I-165 will be signed as the William H. Natcher Expressway. Construction is underway to bring the Natcher Parkway in Ohio and Daviess counties up to interstate standards. The work zone runs north from the Ohio-Butler County line to the U.S. 60 Interchange in Daviess County. 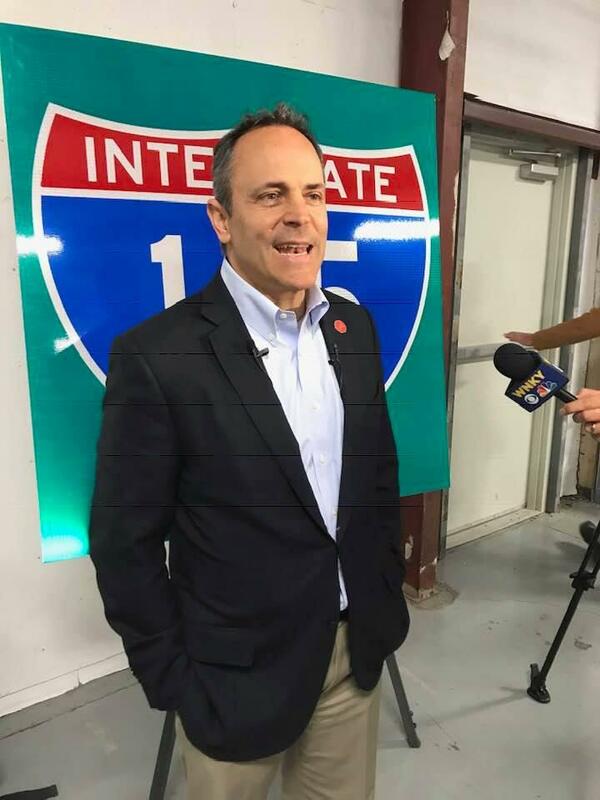 Keith Todd, a spokesman for the state Transportation Cabinet, says the work will include the removal of concrete where toll booths were once located under the Kentucky 69 overpass. "When we took out those tollbooths several years ago, it left some rough concrete that has deteriorated over the years, so they're going to jack hammer that out and replace that pavement," Todd explained. Kentucky earned a grade of C- in a new infrastructure report card from the state’s American Society of Civil Engineers. The state received a grade of C in the last infrastructure report card in 2011. Kentucky’s civil engineers looked at the Commonwealth’s aviation, roads, bridges, drinking and waste water and energy. The Kentucky Transportation Cabinet recently instituted a program to restore more than one thousand bridges across the state. The repairs are expected to extend the life of the bridges by 30 years. Tom Rockaway is the chair of Kentucky’s infrastructure report card committee. The state Transportation Cabinet is conducting a traffic study near the campus of Western Kentucky University. The area from the Morgantown Road intersection to the University Blvd intersection is heavily congested, as well as the surrounding roads. Transportation Cabinet Spokesman Wes Watt says construction is still several years away, but the study will determine if several small projects can improve safety and traffic flow or if major construction is need.